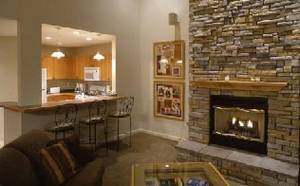 You can find complete information on our condo & take a photo tour at our website: www....com. 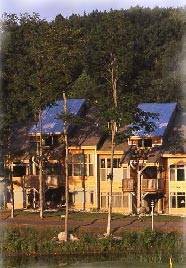 Our 2400' ft condo is located in the Cedar River Village of the Shanty Creek Resort. 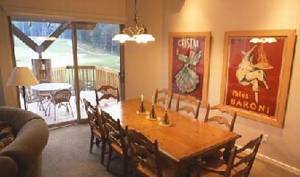 The unit overlooks the 18th green of the Tom Weiskopf designed Cedar River Golf Course and is on the slopes of the Schuss Mountain Ski Resort for ski in/out convenience. 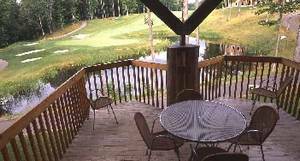 The condo is a one minute walk from conveniences and features of the Cedar River Lodge, which include the golf pro shop, two restaurants, cocktail lounge, exercise room and year round outdoor pool. For sleeping comfort the unit features three bedrooms. 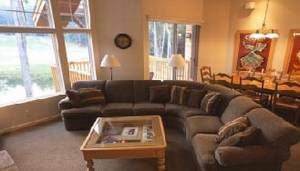 A downstairs master with a king size bed, 27" Sony TV, cathedral ceiling, deck access and Jacuzzi bath. 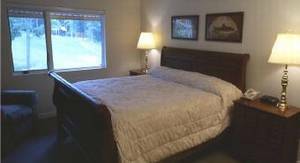 Upstairs master with a king bed, 27" TV, and private bath; and a guest room with two queen beds and TV. The loft has two twin sleepers. 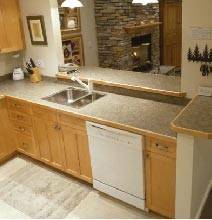 Unit has 3 1/2 baths, a washer and dryer, and one car garage. For entertaining the unit is well equipped. The living area is equipped with a 40" Sony HD flat screen TV with surround sound, CD & Blue Ray DVD. Cable service includes movie channels and high speed internet connection. The focus of the living/dining area is the 16 foot stone chimney of the fireplace and the expansive views of the Lodge and the 18th fairway and green. The kitchen includes all major appliances. All dishes, glassware, flatware, and linens are included. Weeknights are Monday-Wednesday. Weekends are Thursday-Sunday. Deposit: 50% to hold reservation. Balance due 30 days before arrival. Cancellations and Refunds: Deposit fully refundable if cancellation occurs 30 days or more before arrival. 50% refund if cancellation occurs within 30 days.